With a goal of eventually including audio translations in 300 different languages, Unite For Literacy is more than just a source for online books. Committed to promoting literacy by providing books to children's' homes in Colorado, the organization launched its digital picture book library August 2013, allowing anyone with Internet access to choose from UFL’s more than 100 free e-books,. 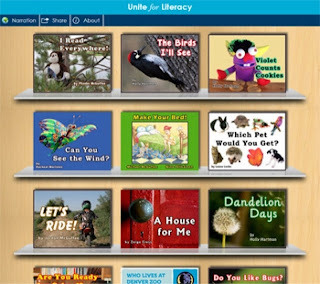 Unlike other available e-book libraries, Unite for LIteracy books don’t require registration, downloading, or extensive searching through categories. The virtual books look like print versions with clean two-page spreads and pages that can be "turned" on a computer or any mobile device. Each page is illustrated and includes an audio narration . Unite for Literacy can be a great resouce for early elementary classrooms, especially in some of the first grade classrooms in the Acton-Boxborough district, where iPads are used for listening centers. Add a shortcut to Unite for Literacy to the Home Screen, and students have instant access to quality audio-visual picture books! Audio translations of the books are available in up to 17 languages so far, so Unite for Literacy is also ideal for ELL students.